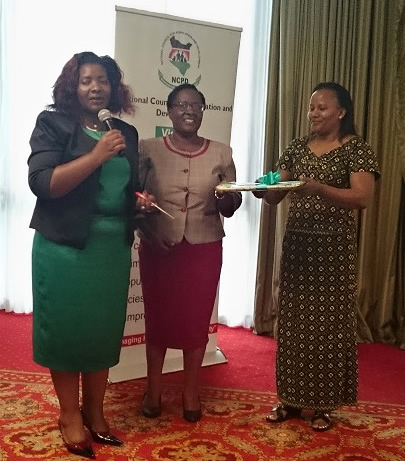 Dr. Nyamai (left) with Dr. Kibaru-Mbae (middle) and a member of NCPD staff at the ImpactNow launch in Nairobi. Photo by Health Policy Project. NAIROBI, Kenya—This week, the Kenya National Council for Population and Development (NCPD) launched a new model which helps make the case for national and county government investment in family planning (FP). The model, termed ImpactNow, was developed by the USAID-funded Health Policy Project (HPP) and demonstrates how investments made in FP programs lead to health and economic benefits for a country and its people. It is designed to help policy advocates make the case to decisionmakers for investing in FP by demonstrating the near-term (2–7 years) benefits of doing so. In Kenya, there have been general improvements across health indicators and outcomes. Over the last decade, the country has seen a steady decline in fertility, from a high of 4.6 children per woman in 2008/2009 to 3.9 in 2014. The proportion of married women who use modern FP methods increased from 39 percent to 53 percent over the last five years, an annual increase of 2.3 percentage points. There has also been a reduction in the unmet need for FP (proportion of married women who do not wish to become pregnant but are not using a FP method), from 26 percent in 2008/2009 to 18 percent currently. To maintain these gains and ensure further progress, the national and county governments must make modern FP a higher priority in policies, programs, and budgets. If they do so, the ImpactNow model shows that Kenya would enjoy vast health and socioeconomic benefits. For instance, Kenya currently loses 5,500 mothers each year due to pregnancy- and birth-related complications. If the national and county governments prioritize FP and increase investment in FP programs, Kenya would save an additional 2,138 mothers’ lives by 2020. Similarly, if county governments prioritize FP, Kenya would avert an additional 850,000 unintended pregnancies by 2020, and reduce the incidence of unsafe abortions, medical complications, and interrupted schooling. Further, through increased investments in FP, Kenya would save an additional Ksh 6.8 billion in healthcare costs by 2020, which could be used to invest in other health sectors such as in strengthening commodity supply chain systems, the hiring and training of healthcare workers, and facility improvements. For Kenya to achieve its potential health and economic benefits, county governments in particular must prioritize investments in voluntary and high-quality FP. In particular, county governments should establish and fund FP-specific budget lines. County governments should also adapt and implement national policies, and scale up training and counselling for FP service providers on long-acting reversible contraceptives—methods which are more effective and less expensive than injectables, pills, and other short-acting contraceptives. To reduce teenage pregnancies, county health services should also adopt a youth-friendly approach to service delivery and work with partners to enhance access to services and information for sexually active youth. Speaking at the launch event, the Director General of the NCPD, Dr. Josephine Kibaru– Mbae commended HPP and the Kenya FP Advocacy Technical Working Group for applying the ImpactNow model in Kenya and showing the benefits in terms of the number of maternal and child deaths averted, unintended pregnancies, and costs saved. “This model will help us advocate for more domestic funding for family planning in Kenya, especially for commodities,” she said. The Chairman of the Kenya Parliamentary Health Committee, Honourable Dr. Rachel Nyamai, also commended the application of the model in Kenya, saying that there is an urgent need to raise awareness among members of Parliament about the benefits of accelerated investments in FP. She went on to say that the committee will press for the inclusion of more resources for reproductive health and FP in the 2015/2016 national budget and will ensure that reproductive health commodities are prioritized by the government and integrated into the general commodities supply chain.